Rep. 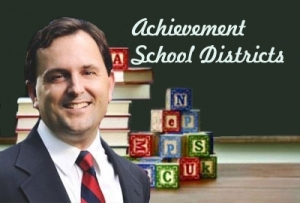 Rob Bryan, R-Mecklenburg, was the chief backer of achievement school districts in the legislature. State Board of Education members next week will discuss a timeline for phasing in “achievement school districts,” charter takeovers of a few low-performing schools in the state. State lawmakers approved the new district model in late June, and given the bill’s prescribed timeline, state board members have indicated they intend to move quickly to fulfill its requirements, including the selection of a district superintendent and qualifying schools. That said, as state officials are expected to explain next week, the approved bill, House Bill 1080, does offer some flexibility on the board’s timeline. In the discretion of the State Board of Education (i) the ASD Superintendent may not be required during the 2016-17 school year to recommend qualifying schools for inclusion in the ASD for the 2017-18 school year and (ii) the time line for selection of achievement schools for the 2017-18 school year provided in G.S. 115C-75.7 may be varied, but in no event may the local board of education’s decision occur later than April 1, 2017. The State Board of Education may select up to five qualifying schools to transfer to the ASD beginning with the 2017-18 school year but shall select at least two qualifying schools to transfer to the ASD no later than the 2018-19 school year and shall have selected five qualifying schools for transfer to the ASD no later than the 2019-20 school year. In other words, state board members will have some limited control over how quickly the controversial model begins in North Carolina. Supporters say the achievement school district will provide a boost to chronically low-performing schools, but critics point to the reform’s middling results and troubled finances in other states as reason for concern. Board members are also expected to take up charter funding, school performance grades and virtual charters in next week’s regular monthly meeting, which begins via conference call at 9 a.m. Wednesday.